It's September and a brand new year is just about to begin! We kicked things off with Hineni weekend this past Saturday and Sunday, hosting an intimate gathering of friends and supporters at the house for a fundraiser which included a concert by yours truly as well as lovely desserts made by Rev. Heidi! The house was absolutely sparkling, with beautiful sunflowers laid out on the dining room table and a freshly re-decorated living room with a new reading corner! We are so looking forward to evenings in the new space. This week we'll have our very first programming session! 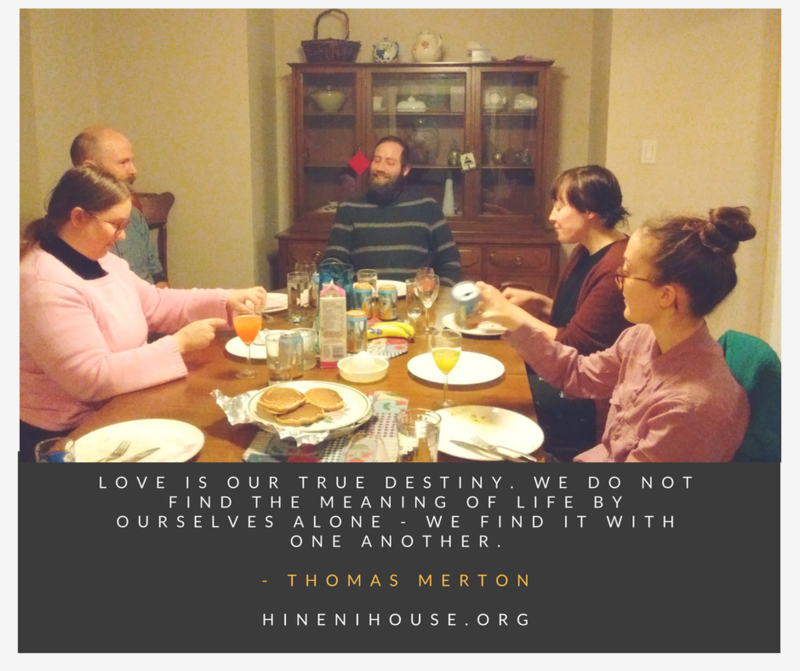 We've switched our meeting nights to Thursdays and will begin with all of the nuts and bolts of community, eventually transitioning into deeper conversations about how we communicate, our Enneagram numbers, our conflict styles, and how we will offer hospitality at Hineni House. So far we've done well on the latter! While Hineni weekend was not as massive as we had hoped, our four residents did their very best to create a warm, beautiful, and welcoming place for everyone to enter into. A few weeks ago, we were even able to offer very short-term housing for a prospective resident for next year who came all the way from India! All of us at Hineni House are excited to begin a brand new year of adventure, introspection, and friendship. Please keep us in your prayers! After heartfelt goodbyes and a laughter-filled dinner at my place, many of our residents moved on and we opened the first two windows of application! So far we've had a total of four applications and even more inquiries from interested folks - and now I can say they were "from all around the world," as our latest application came in from India! We have accepted two applicants already and have conducted a first interview with someone else, and are setting up an interview with the applicant from India, who is coming to UBC to do a Master's in Education and Counseling. The summer has been a bit more eventful for me than expected as Rev. Heidi, the rector of St. Margaret's, is away on sabbatical and has left me to hold down the fort. The community has clearly been praying for us as all of our applicants so far have been impressive, even exemplary. I am so SO looking forward to what I think will be an amazing year of adventure, deep conversations, and laughter at Hineni House. Remember to share and/or tell your young seeker friends about Hineni House, and know that it's okay if they just have questions for now. It's a big decision to make, so even if they're considering waiting a year, we would love to hear from them or you! Hi, friends! I obviously let posting go for way too long! Our Lenten video series didn't pan out quite the way we had hoped, but the videos that were submitted have been uploaded to our Facebook page if you'd like to explore! I do hope we can try again in Lent 2019, or maybe do a seasonal podcast. So much of what is said in our groups is incredible that I want to share it with others. In Holy Week we instituted a service that we hope will become a yearly tradition at Hineni House: an anointing ritual. Using holy oil from St. Margaret's, we anointed each other's hands and prayed that we would take the lovingkindness and growth from our time at Hineni House out into the world with us as we prepared for the last few weeks of programming. I brought the big harp to help us with our music and personally found it all to be quite powerful. "Hineni House has been my ecology of prayer, the oikos, the dwelling place of prayer. It's been the container for my prayer life." "I was looking for a soft landing when I moved into this house, but as soon as I moved in I knew good things were going to happen here." "I remember feeling like I was falling and somebody caught me; it was a place I could stop and breathe. I have found a place here where I could be at peace. ...For too long I functioned without a sacred space, a space that's dedicated to something outside of the ordinary function of work and everything. I don't think I'd like to go forward without it." "What I want to keep with me from my time here is this sense of community. There's been a lot of laughter and fun...and then we come here [to program] and we can have some intense and personal, sometimes hard discussions about things, and that's totally okay." "Community takes time. Don't fret if it's not gelling right away. Trust takes time, but if you work hard with an open mind it will come in the end." "Be honest with yourself about why you're coming here. Have a conversation with yourself about why you want to live here. You should be seeking something, and you should know something about yourself." Good advice, I think! And although I haven't checked yet, I did tell residents to leave inspirational and helpful messages for future residents in a huge book we were left by my predecessor Hannah. If they remembered to do that, I'll make sure I share some with you. Peace! I'm going to split this post so the next one will be an update on where we are now. For the season of Lent, we asked residents and other folks affiliated with Hineni House to share short reflections on particular words chosen for their spiritual or seasonal relevance. Here's me (go figure) with some thoughts on "glory." The writers of this blog are all the wonderful people who make up Hineni: the residents (or Hinenites! ), the workers, the volunteers, and the folks of the St. Margaret's Cedar Cottage Church community.